I read a lot of books as a child and many of them have gotten lost in the mists of my memory. Some of them, however, have gotten lost in actuality. This is one of them. I don't remember where we first found a copy of this book. I just pulled it off our bookshelves one day and got lost in the story. I read it over and over which is what I tended to do with any book that caught my fancy. I didn't love it the way I loved Little Women and the Little House books but it was a book I was a bit obsessed with for a while. Then, at some point, my mom thinks she loaned it to a friend and it vanished never to be seen again. The story stuck in my head though and from time to time I wished I could read it again purely for nostalgia's sake. Now I have a daughter and I have slowly been accumulating all the books I think it is vital for her to read. This book kept popping into my mind but I didn't remember the title, I had not idea who the author was, and, by this point, my memory of the story was a bit fuzzy. 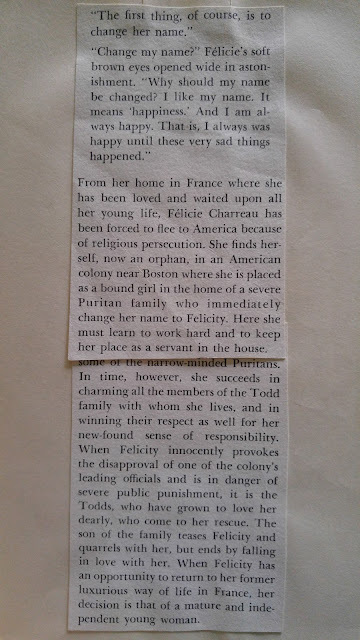 All I remembered clearly was that the girl's name was Felicity, she lived as a servant in Puritan America, and the title had the word 'bound' in it. Oh, and that there was a bit of romance at the end which thrilled my little ten-year-old heart all those years ago. From time to time I would do a little puttering online trying to find out exactly what the title was and who wrote it. I wasn't too successful at first. There are a lot of books out there and searches for books with the word 'bound' in the title can turn up some interesting things. 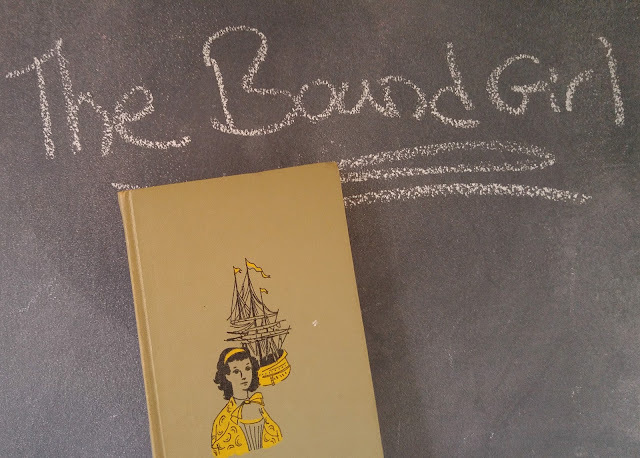 One day, though, I stumbled across a copy of The Bound Girl by Nan Denker. The cover had a puritan scene on the cover which was reassuring after some of the other things I had come across but I still wasn't sure it was the right book. There was no description of the story line at all. I filed it away in the back of my head and periodically looked to see if I could find copies and if there was any more information. Recently, I came across this copy. It had a description that made it clear it was the book I wanted but it was more than I really wanted to pay. I added it to my cart and kept checking back when I remembered and, lo and behold, the price eventually dropped down to next to nothing and I joyfully clicked the 'purchase' button. I know this isn't really an enthralling story but it has made me happy. It is a bit of my childhood, of my book history, that I can now pass on to my daughter. I hope she enjoys the book as much as I did all those years ago and I hope her little ten-year-old heart is just as thrilled by the bit of romance. I am going to read it again myself though part of me almost doesn't want to. What if it isn't nearly as good as I remember? I don't think, though, that it really matters. I will be reading it through the eyes of the little girl I used to be and that little girl will still love it. In case you want a more complete description of the story here is a picture of the synopsis that is pasted inside the front cover. Are there any books that you have lost track of or wish you could remember more clearly? It's so satisfying that you were able to track this book down again after all these years. I hope you enjoy the re-read. I was mildly obsessed with The Fairy Queen for a little while in elementary school and still thought of it from time to time, but all I could remember decades later was that it featured a baby with blue hair and a scary cover. Then someone (I wish I could remember who!) mentioned it in a blog post and the pieces fell into place! I was so excited that I ordered it right away but haven't had the courage to reread it yet. I don't think I ever read The Fairy Queen. I hope when you reread it you find it as good as you remember. That is the good thing about blogging and the internet. It is so much easier to track down books. I wish I had kept track of the books I read when I was younger. It would be nice to have the record and I am sure there are many I don't remember now. I had a similar experience with a book called 101 Bells, about a girl growing up in Japan. The author also wrote a book about a young orphan in Philadelphia, apprenticed to a seamstress (an artist) . I read these obsessively as a child, but never thought about the author. I could tell you where they were shelved in the library, but not who wrote them. And until I discovered ABE books, what I remembered wasn't enough to help me track the books down. Fortunately my two rediscoveries were just as good as I remembered. I hope yours is too! Your books sound interesting. I loved books as orphans when I was a kid, not sure why. I am glad they lived up to your memory. I have one more book I would love to find. All I remember is there is a picture of a woman from the middle-ages on the cover and a knight (?) in the story had to prove his honor by grasping a sword heated up in a forge. Not much to go on is that? I finished The Disorderly Knights last night. The next in the series is waiting on the table for when I get home. I told myself I should spread them out but that doesn't seem to be happening. Ooh, this sounds so interesting for Reading New England but my library does not have it and I don't know if I have your commitment to hunt down a copy...I will keep an eye out for it though. Reading New England sounds interesting. I will have to check it out on your blog.